Reminiscences of Mary Brown during the grasshopper invasion for the years 1866 and1867. 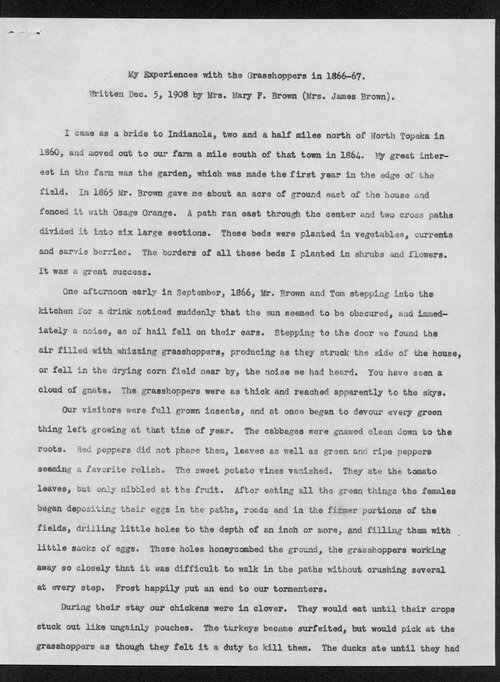 Mary writes of the grasshoppers devouring almost every bit of green vegetation in sight and her attempts to save her shrubs and flowers from being destroyed. She also writes of the grasshoppers laying eggs, the eggs hatching, and the young eating as much as the adults. This cycle happened several times that year. Once the grasshoppers left, the Brown's replanted with the help of seed sent by Senator Pomeroy.